If you have ever managed to make it down to Nashville, specifically to the Country Music Hall and Fame Museum, you probably couldn’t help but notice a layer of vintage show posters covering the walls on the third-floor exhibit space. These posters are not only historical in the sense of the musical, vaudeville, circus and minstrel shows they once promoted across the country but the iconic vintage style they represent has very much become synonymous with Nashville and its historical music city past. 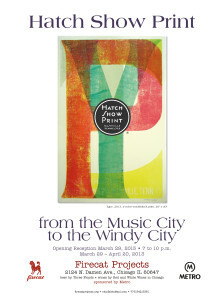 Making its way to Chicago, like any great Nashville performer would do, the Hatch Show Print will make it’s Windy City premiere at a local art gallery, Firecat Projects, located in Bucktown.